AS THE MESSAGES OF GARABANDAL!!! 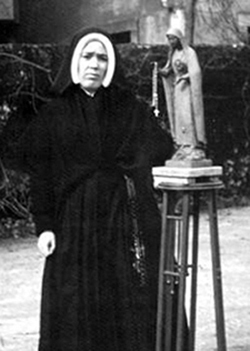 On December 26, 1957, Father Augustine Fuentes interviewed Sister Lucy at her convent in Coimbra, Portugal. “Father, The Most Holy Virgin is very sad because no one has paid any attention to Her Message, neither the good nor the bad. The good continue on their way but without giving any importance to Her Message. The bad, not seeing the punishment of God actually falling on them, continue their life of sin without even caring about The Message!!! God will chastise the world and this will be in a terrible manner. The punishment from Heaven is imminent. Father, how much time before 1960 arrives? It will be sad for everyone. Not one person will rejoice at all if beforehand the world does not pray and do penance. I am not able to give any other details because it is still a secret. This is the part of The Message of Our Lady which will remain secret until 1960. Tell them, Father, that many times the Most Holy Virgin told my cousins Francisco and Jacinta, as well as myself, that MANY NATIONS WILL DISAPPEAR FROM THE FACE OF THE EARTH. SHE SAID THAT RUSSIA WILL BE THE INSTRUMENT OF CHASTISEMENT CHOSEN BY HEAVEN TO PUNISH THE WHOLE WORLD IF WE DO NOT BEFOREHAND OBTAIN THE CONVERSION ON THAT POOR NATION. Father, that is why my mission is not to indicate to the world the material punishments which are certain to come if the world does not pray and do penance beforehand. NO!!! MY MISSION IS TO INDICATE TO EVERYONE THE IMMINENT DANGER WE ARE IN OF LOSING OUR SOULS FOR ALL ETERNITY IF WE REMAIN OBSTINATE IN SIN. The first reason is because She told me that the devil is in the mood for engaging in a decisive battle against the Virgin. And a decisive battle is the final battle where one side will be victorious and the other side will suffer defeat. Also, from now on we must choose sides. EITHER WE ARE FOR GOD OR WE ARE FOR THE DEVIL. The second reason is because She said to my cousins as well as to myself, that God is giving TWO LAST REMEDIES TO THE WORLD. THESE ARE THE HOLY ROSARY AND DEVOTION TO THE IMMACULATE HEART OF MARY. These are the last two remedies which signify that there will be no others. The third reason is because in the Plans of Divine Providence, God, always, before He is about to chastise the world, exhausts all other remedies. Now, when He sees that the world pays no attention whatsoever, then as we may say in our imperfect manner of speaking, He offers us with 'certain fear' the last means of salvation, His Most Holy Mother. It is with 'certain fear' because if you despise and repulse this ultimate means, we will not have any more forgiveness from Heaven, because we will have committed a sin which the Gospel callsThe Sin Against The Holy Ghost. This sin consists of openly rejecting, with full knowledge and consent, the salvation which He offers. Let us remember that Jesus Christ is a Very Good Son and that He does not permit that we offend and despise His Most Holy Mother. We have recorded through many centuries of Church history the obvious testimony which demonstrates by the terrible chastisements which have befallen those who have attacked the Honor of His Most Holy Mother, how Our Lord Jesus Christ has always defended the Honor of His Mother. The devil knows what it is that most offends God and which in a short space of time will gain for him the greatest number of souls. Thus, the devil does everything to overcome souls consecrated to God, because in this way, the devil will succeed in leaving the souls of the faithful abandoned by their leaders, thereby the more easily he will seize them. That which afflicts The Immaculate Heart of Mary and The Heart of Jesus is the FALL OF RELIGIOUS AND PRIESTLY SOULS!!! 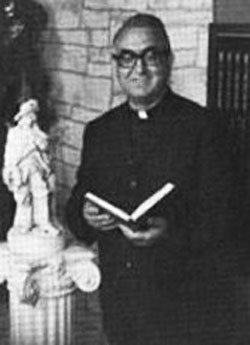 THE DEVIL KNOWS THAT RELIGIOUS AND PRIESTS WHO FALL AWAY FROM THEIR BEAUTIFUL VOCATION DRAG NUMEROUS SOULS TO HELL. THE DEVIL WISHES TO TAKE POSSESSION OF CONSECRATED SOULS. HE TRIES TO CORRUPT THEM IN ORDER TO LULL TO SLEEP THE SOULS OF LAY PEOPLE AND THEREBY LEAD THEM TO FINAL IMPENITENCE. 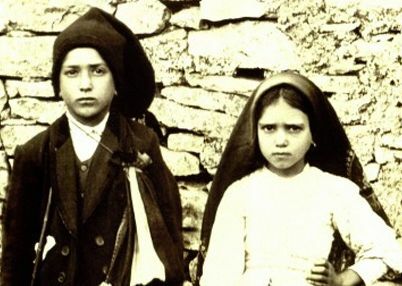 Tell them also, Father, that my cousins Francisco and Jacinta sacrificed themselves because in all the apparitions of the Most Holy Virgin, they always saw Her very sad. She never smiled at us. This sadness, this anguish which we noted in Her, penetrated our souls. This sadness is caused by the offenses against God and the punishments which menace sinners. And so, we children did not know what to think except to invent various means of praying and making sacrifices. Father, we should not wait for an appeal to the world to come from Rome on the part of the Holy Father, to do penance. Nor should we wait for the call to penance to come from our bishops in our diocese, nor from the religious congregations. No!!! Our Lord has already very often used these means, and the world has not paid attention!!! That is why now, it is necessary for each one of us to begin to reform himself spiritually. Each person must not only save his own soul but also help to save all the souls that God has placed on our path. These are the last two remedies which signify that there will be no others...The Most Holy Virgin in these last times in which we live has given a new efficacy to the recitation of the Rosary to such an extent that there is no problem, no matter how difficult it is, even of the life of peoples and nations, that we cannot resolve by the Prayer of the Holy Rosary. With The Holy Rosary, we will save ourselves. We will sanctify ourselves. We will console Our Lord and obtain the salvation of many souls. 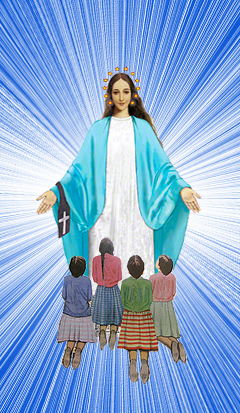 In Garabandal, the Blessed Mother taught the four girls how to say the Rosary and told Mari Loli that she should pray 15 decades every day. 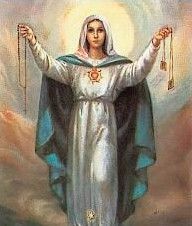 At Fatima, The Blessed Mother appeared, holding the Rosary and the Brown Scapular, as a silent example for us to take advantage of these important sacramentals. At Garabandal, The Blessed Mother appeared, holding the Rosary and the Brown Scapular, as a silent example for us to take advantage of these important sacramentals.